P5 helped P3 to create tautograms which was part of written and oral expression for both levels. “What you understand well, you enunciate clearly!” said French author Boileau. Last week, some Mums spent some special time with M0. 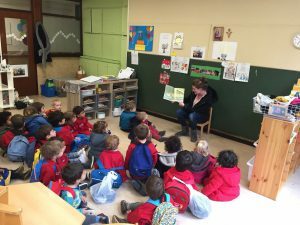 This reading session was with Mathilde’s Mother – the children are listening to a lovely nursery rhyme! 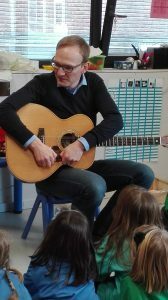 Beginning of March, Musical week in the kindergarten. 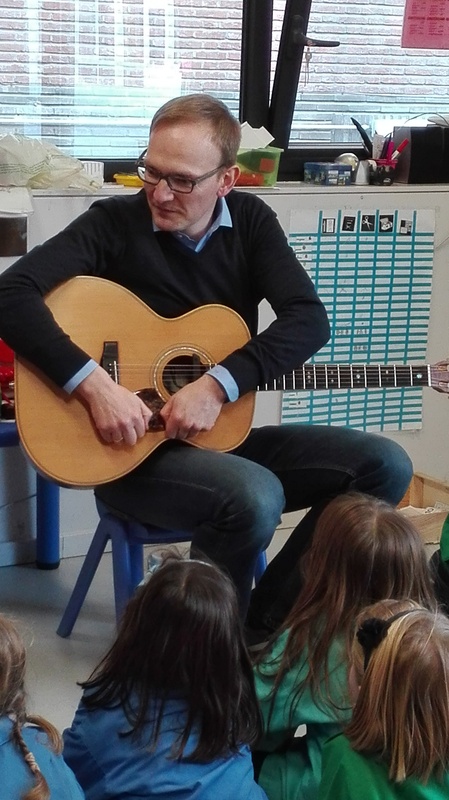 Musicians galore…the kindergarten welcomed some of the parents, who participated wholeheartedly in performing for the children. Many thanks for the wonderful shows. On 2nd February 2018 the pupils of P6 organised the annual charity Pancake Day. Over 500 delicious pancakes were sold after school to parents, children and friends. Over 850 euros was raised. This money was donated to Les Mains Ouvertes a Charity based in Haiti. The money raised will pay for 4 children to go to school for a year. 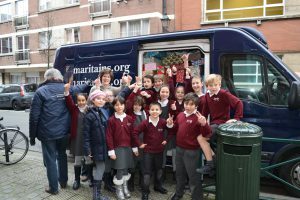 During December 2017 children and parents of the school participated in the Shoebox Appeal organised by Les Samaritains. Shoeboxes were filled with non perishable food and drink items to be distributed to poor and homeless people over the Christmas period. Over 200 shoeboxes were donated. Yet again this year, the kindergarten children with all their hearts honoured their grand parents . 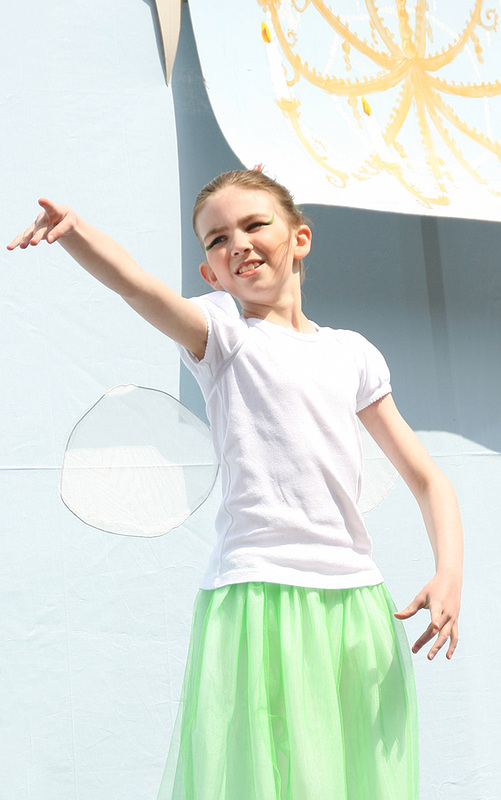 around a festive snack, creative workshops and recitals, the grand parents could share this privileged moment with their grandchildren & visit their classes. 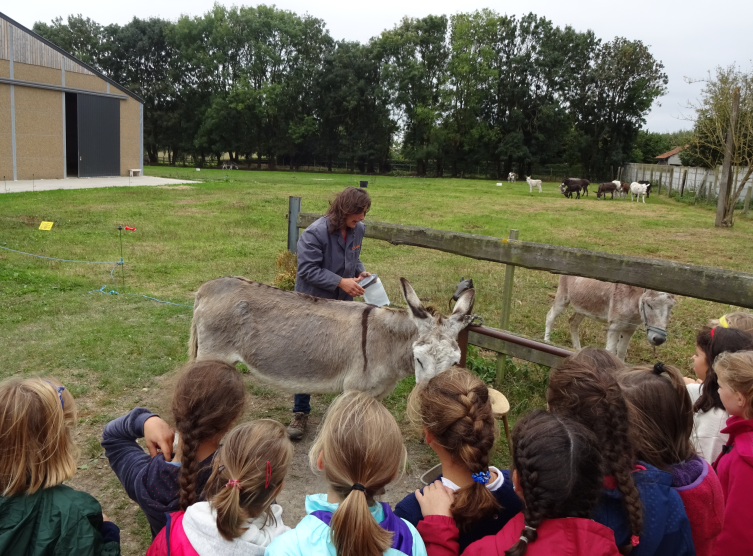 Last Friday, 13th October 2017, the children from P2 to P6 went to visit the sanctuary of Beauraing. The children had the opportunity to watch a film about the history of Mary’s apparition and they could ask questions about the Blessed Virgin who is also called the “Virgin with the heart of gold”. 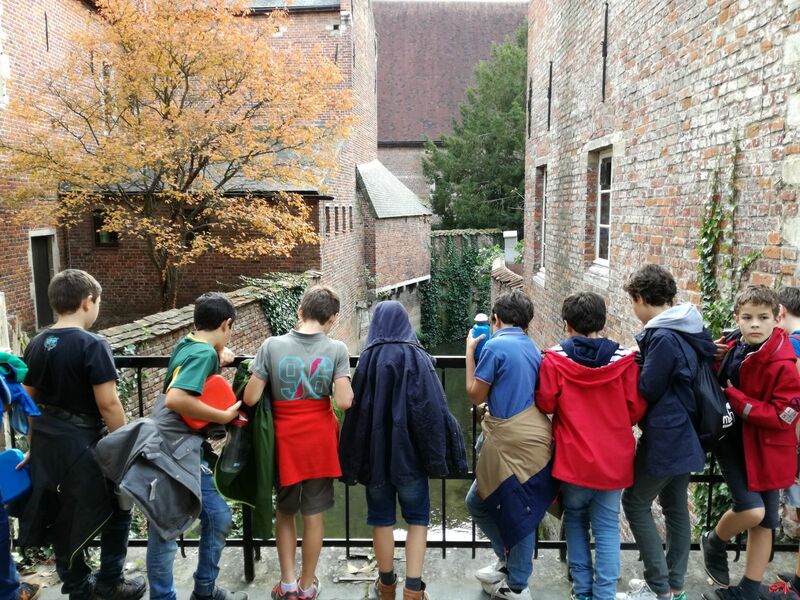 On the 28th and 29th September, the 30 boys of P4, P5, and P6 visited the city of Leuven on a 2 day school trip. As part of the programme they discovered some of the historical sights of Leuven – the Town Hall, the Collegiale, the Botanical Garden, the main City Square, the ancient house of religious people. They also had time to relax – playing football and baseball, a games evening and swimming at the new Sports Complex in Leuven. 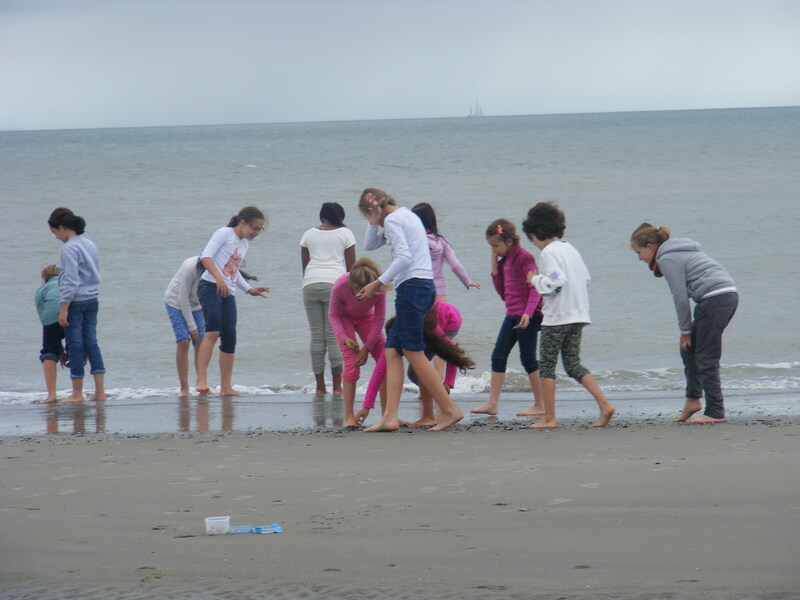 This year, the girls of P4, P5 and P6 went on a seaside trip to the Belgian coast. 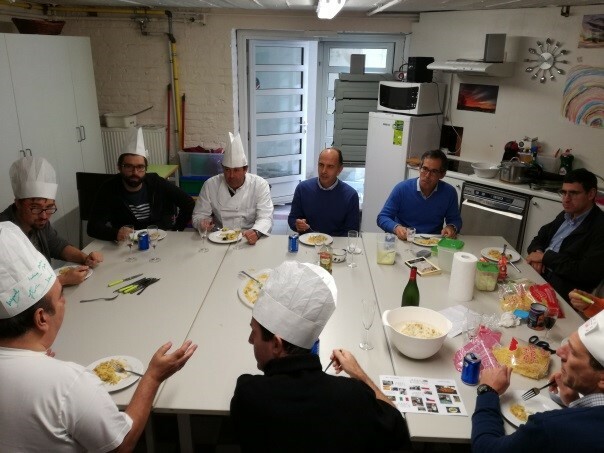 The highlights of this trip were joy, good humor and multiple learning objectives which were achieved thanks to the discovery of the fauna and flora of this region and by analysing shells, algae, shell fish … They also discovered the life of a fisherman by visiting a boat in Oostende. 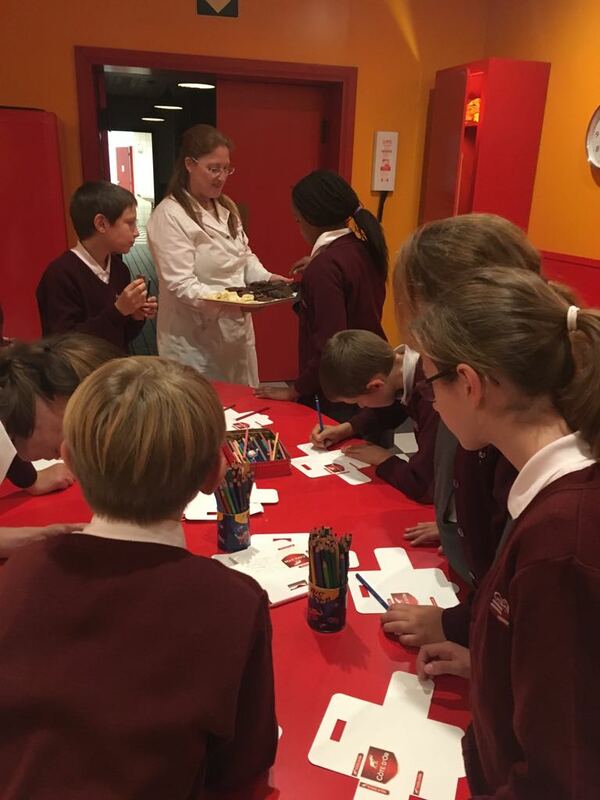 22th September 2017 -The student of P6 had the pleasure of discovering ‘The temple of chocolate ‘ in Halle. First, they had a guided visit of the factory, which was very noisy but, where they could see the different stages in the fabrication of a tablet of chocolate ; as of the first ingredients brewed in 20,000kg tanks to the wrapped bar in its brightly coloured carton. Afterwards, they discovered the history of chocolate. First in the Aztec temple, then in one of the Spanish gallions & finally a factory dating from the 20th century. Finally, they were invited into the kitchen, where they moulded a chocolate bar by themselves. They designed their own wrapping & participated in a fun quiz. It was a passionate & treat filled afternoon which, left them with great memories ( and tasty chocolate )! We had a great sports day! 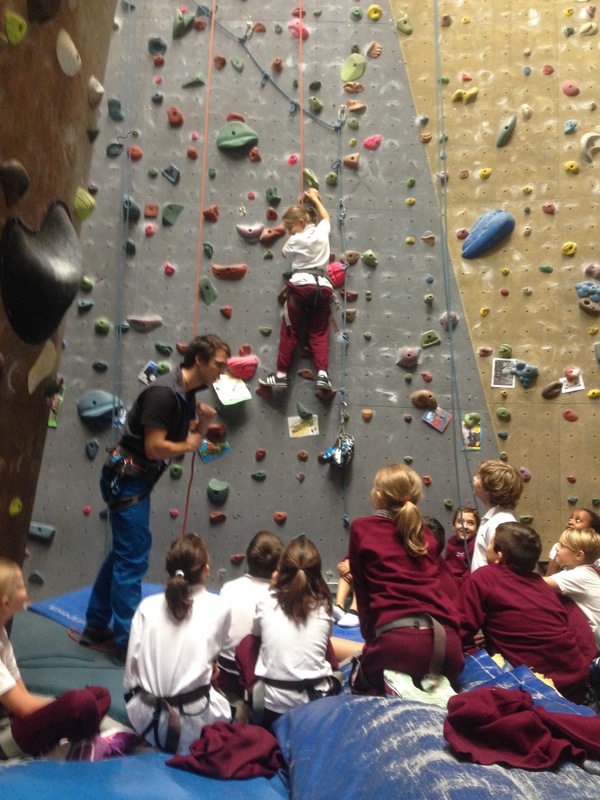 Climbing has no secrets for P6’s pupils ! This year the grandparents were the VIPs of the party. This was a day when different generations came together in various workshops. Pupils could show their grandparents their talents and around the school as well. 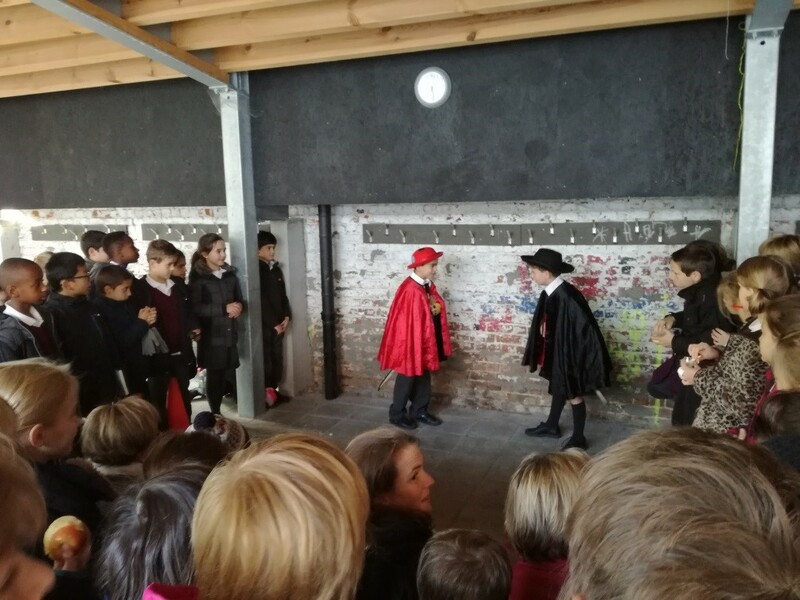 This group established and managed by Constantin, Charles and other puplils from Primary 4, gave a performance about the famous tirade of Cyrano de Bergerac’s nose. Supervised by Etienne – « Swallow’s Nests and Crêpes » All washed down with Burgundy and Calva. Under the supervision of Carlos – Bacalhau à Bras & Lulas Recheadas Parabens ! 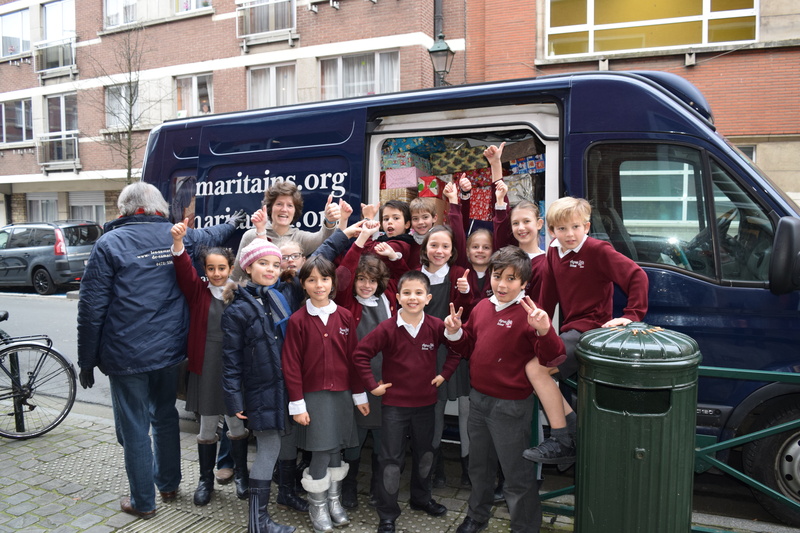 This was a day full of many challenges and different sports for the children of M2 and M3 at Mini Mayfair, Anderlecht. 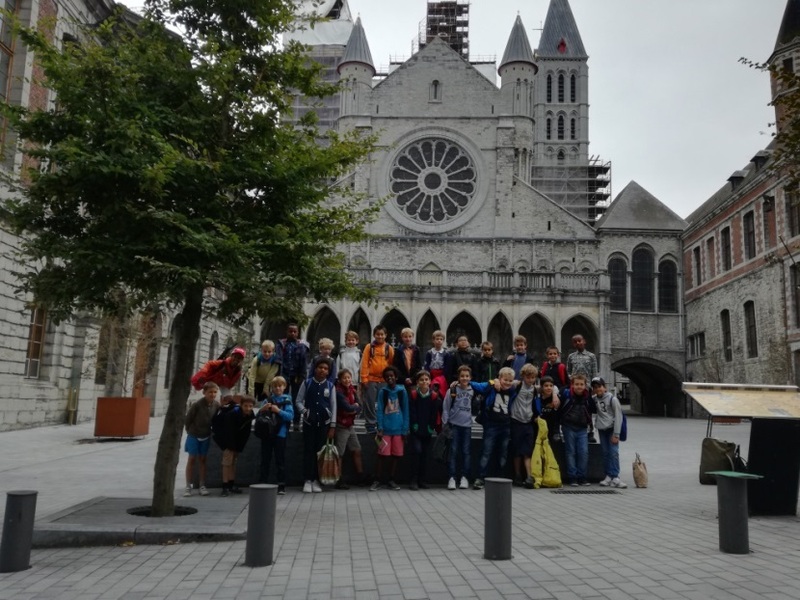 Accompanied by Mr Marco, Mr Claudio and the fathers of Matteo and Gabriel, the group of pupils discoverd the treasures of the town of Tournai : the Cathedral, belfry, military remains… and ended their stay in Jungle City. Under the supervision of Mrs Tennessee, Mrs Eléonore, Mrs Rosalie, Miss Winnie and Miss Rachel, a group of children headed off to Tournai and for two days immersed theselves in life on the farm in order to discover nature and learn about rural life. Mens sana in corpoe sano. 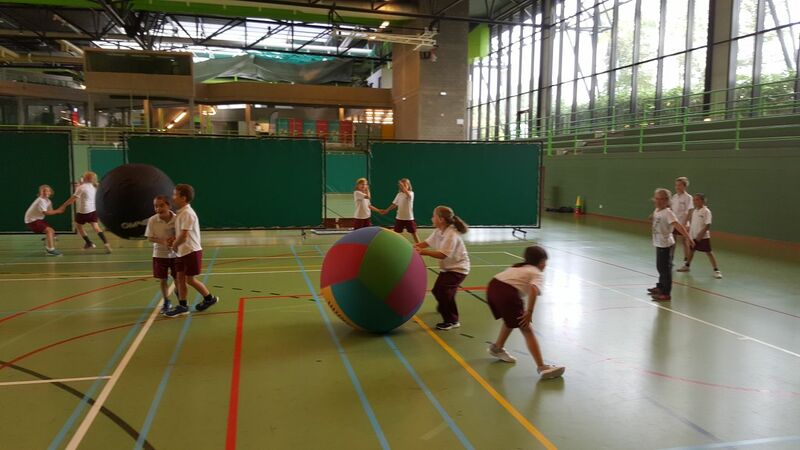 What better way to start the school year and get the class together than a day of sports with ADEPs at the Anderlecht Sports centre. On the 21st and 22nd of April 2016 the pupils of 5th and 6th primary sat the Cambridge Key for Schools English exam. 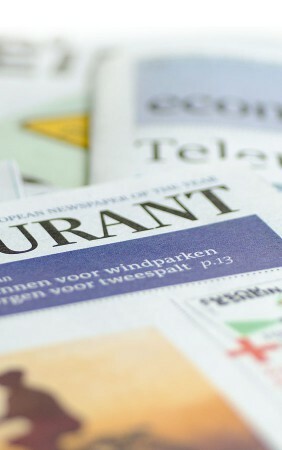 This exam is an international English exam aimed for school-aged learners. 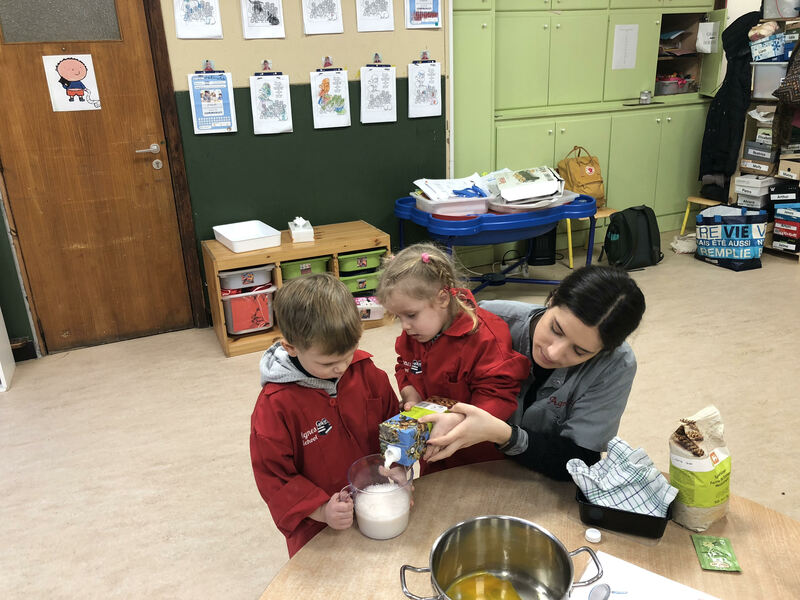 It has been developed according to international standards and is linked into the Common European Framework of Reference (CEFR), the international way to describe language ability. 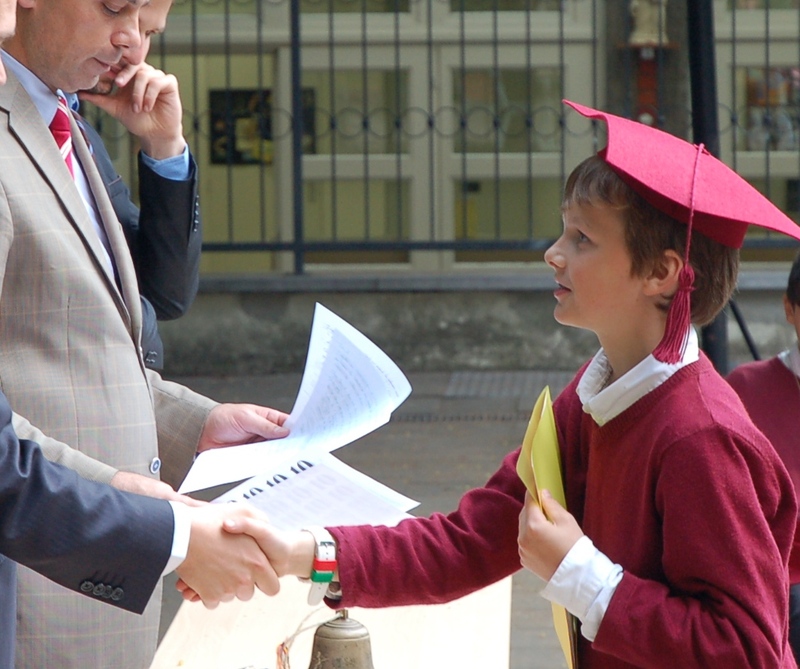 The results are excellent with 75% of the pupils gaining the top level score, an equivalent to B1 proving that the English section is succeeding in its goal. This exam is a great first step in learning English and one that starts off the Cambridge English exam journey. We are very proud here at Agnes of our 5th and 6th primary pupils in achieving these wonderful. This year’s exhibition (March 2016) theme ‘was Twenty thousand leagues under the sea’ just like last year’s exhibition ( ‘ From one pole to another’ ), it came off very successfully. The sixth year primary students , had enormous pleasure presenting this theme to the smaller & younger ones , after months of hard preparation. 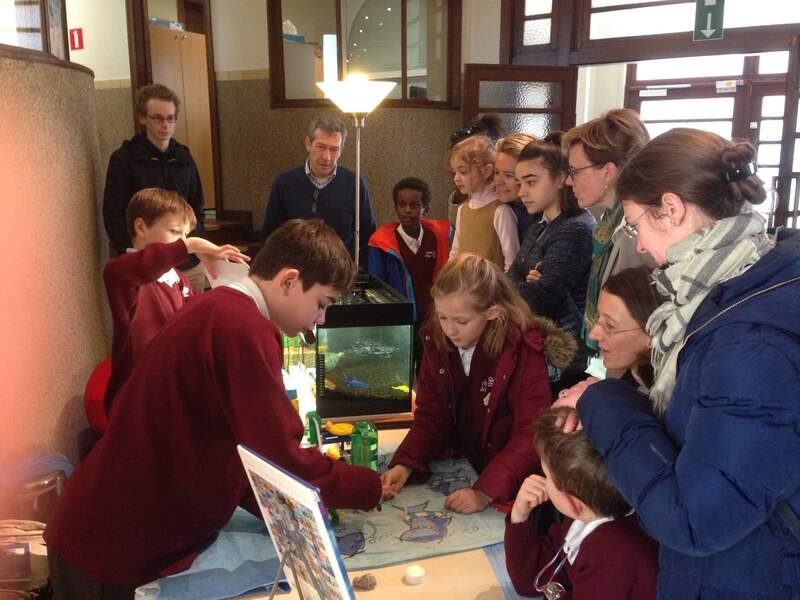 The visitors to the exhibit had the opportunity to learn a thousand interesting things : hydraulic energy, ocean flora & faune as well as ocean treasures , the states of water, nourishing water , the tides , waves & currents , the dangers , myths & legends , the abysse & of course the great explorers. Our guests of honor were ( three goldfish named joseph, Josephine & José ).The younger children were particularly pleased meeting them as well as participating in different scientific experiments. The exhibition came off wonderfully & ended in an evening where the parents were cordially invited to visit our ephemiral museum. 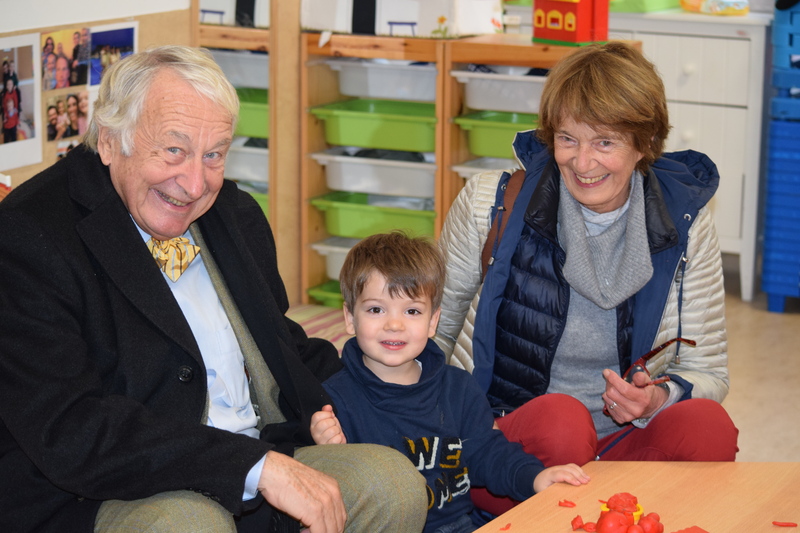 Last Monday January 25th 2016, we had the pleasure of welcoming Madame Inès de Franclieu who came to school to instruct parents on the emotional education of their children. She reminded us of the importance and the urgency of preparing our children to speak of true love. By her wise advice, we learnt how to strengthen our children end develop in them a positive and true vision of how beautiful love can be. Love, in our society, is often reduced to only sexuality that is used as a technique with the sole purpose of bringing pleasure. This view is re-inforced by the things our children see on the streets, on the internet and in the media. Love is more than sexuality even if sexuality can be included in love. Love is the capacity to give totally and only this total gift can lead to happiness. 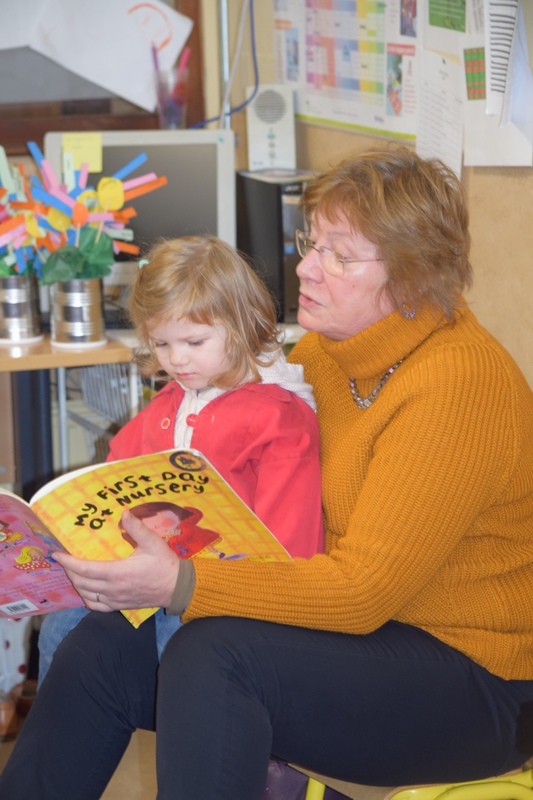 Madame de Franclieu stressed the crucial importance of teaching our children how to distinguish between the fleeting pleasure of happiness and something else that results from a longer, sometimes difficult but always beautiful experience. She also advised us to educate our children in the true way of love and to encourage them to have great and lasting friendships. Nowadays, we hear very little about friendships. Friendships are essential and allow us to open ourselves up more deeply to others. Without meaningful friendships, we are devoid of of sensitivity and this can often prevent us from taking an interest in each other which in turn can become very enriching. Also, our children need to be surrounded by good examples. This example comes first from the parents where our young people can see and experience the love that unites their father and mother even in difficult times, where they can learn and feel what happiness is built on. 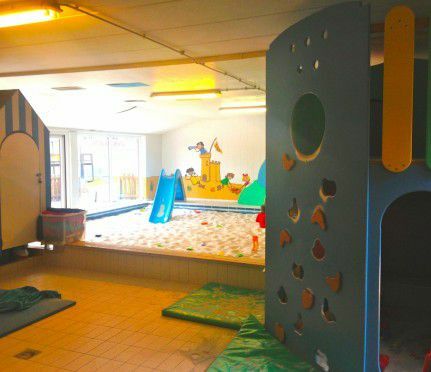 This is so much more than a passing pleasure and children can be told that they are the life that springs from this conjugal love and that the body is beautiful because it gives life. When children are ready for love, it is for parents to talk to them about the beauty of the body that has been made ​​to be given utterly in love as, when two bodies are united in love, it is a beautiful thing. Unfortunately, sooner or later, our children will here about the risk of STDs, unwanted life or unplanned life that some unions may bring. When our children hear such messages, how can they want to have a loving relationship? Not to love, is to permently deprive us of happiness. Instead, lets talk to them about life that is beautiful and bodies that are made to love and give of themselves which, in turn will give friendship and a love that will grow between a man and a women who have freely choosen to live together forever. This is what will allow our children to live their dream of love and will help them to brave the destructive dictates of society. 1: “ Read, profit from every instant of your free time to read &amp; watch less tv / computer. 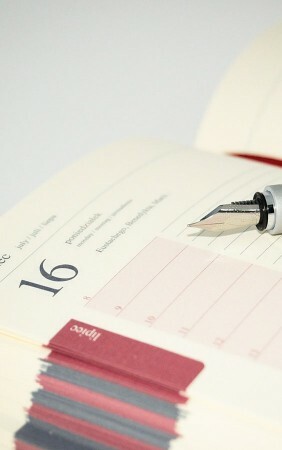 Whilst reading books, you become more patient , you learn to write better, without errors &amp; you create cultural baggage”. 2: “ Here in this school , you have a beautiful spiritual abundance. Profit from it to bring your heart closer to our Lords. Increase your heartiness to that of our Lords heart, only then will you have a great heart”. 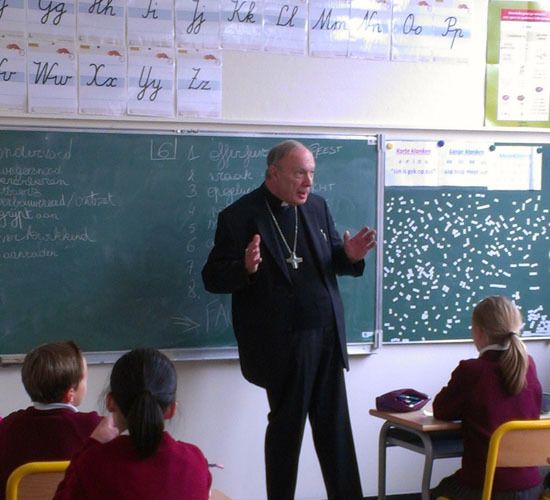 Afterwards, he spoke to the children about the jpys of school……. 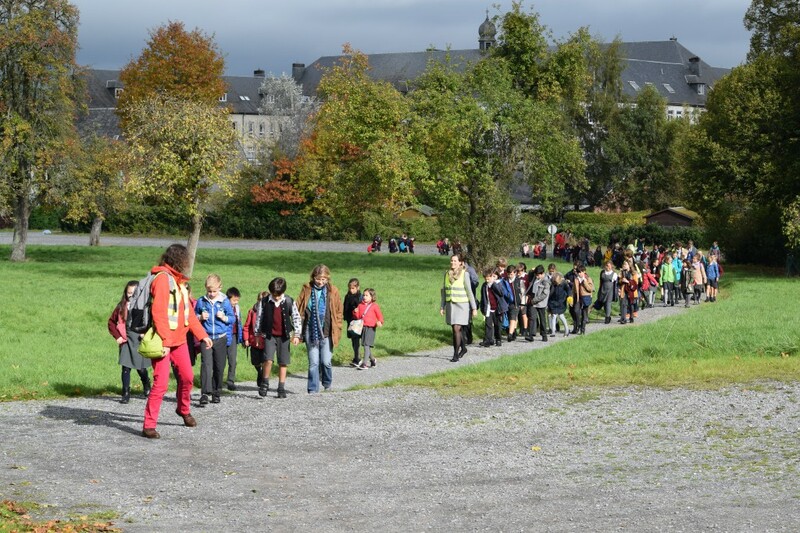 On Tuesday September 29th 2015, we had the privilige of welcoming the non-lucrative association ‘Le jardin des hiboux’ to our school, for a world discovery show about rapaces. 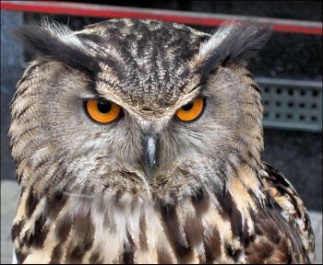 We could observe these birds of prey in real life ! The falconers explained the natural habitat & environment of these majestic creatures , followed by an air show ! During the show , we had the pleasure of watching owls, a Grand duke, a buzzard , an eagle & of course a real life-sized vulture ! 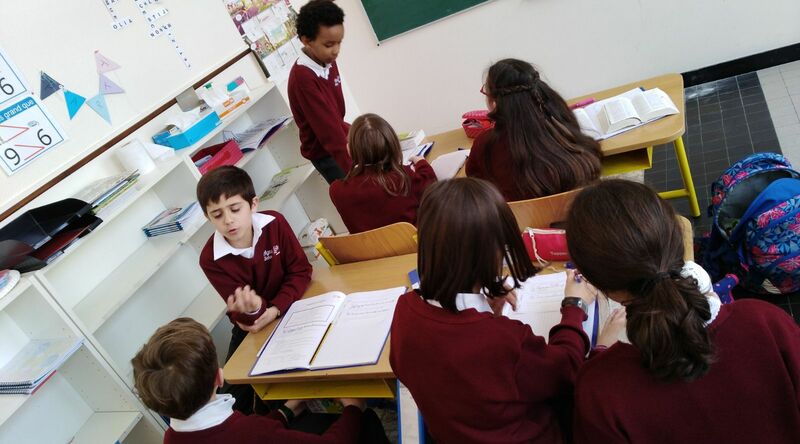 After the show, the M3 English/ Netherlands class had a didactic lesson in the classroom. The children got to see many different types of feathers from these birds of prey with indepth explainations. This event was a memorable experience for the whole school. Vendredi 28/06/2019 à 12h00 Fin des cours – début en vacances d’été. 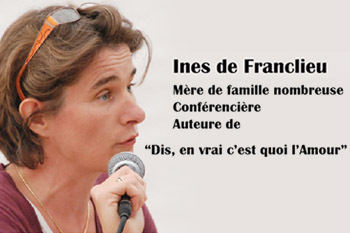 Pas de garderie !! !